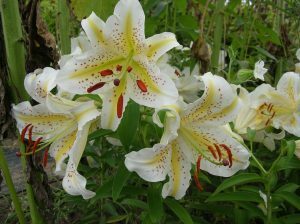 They called it “Queen of the Lilies” in Victorian England. Red spots decorate its recurved pristine white petals with a yellow stripe down the middle of each petal. Queens wear only the best perfume. In late summer its sweet fragrance wafts yards and yards away. A rare classic. In Chinese gardens since 1600’s. In Japanese vegetable gardens since 1700’s – they ate the bulbs. 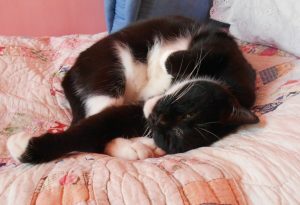 except maybe our little furry Lily who purrs and mews. Bulbs will be ready at the proper time for planting this fall. Lilies are for fall planting just like tulips and daffodils. For local sales email when you can pick them up after October 20. Mail order – we’ll send them at the proper time for planting.